Tahiti is all about sunsets, honeymoons and the only mud you’ll see is in a spa. Right? Well, what is Brian Johnston doing hanging from a rope over a rock ledge, his feet scrabbling for a toehold? My safety helmet has been knocked sideways over one eye. Below me – a long way below me – is a foaming pool of frigid water and tumbled boulders. To my left, a waterfall shudders, sending spray into my eyes. I scramble over the rock ledge to lie moaning in the mud. I’d never realized Tahiti could be such a challenging place. My knees are grazed and my thigh muscles ache. But I also have a big grin on my face. Who needs a mud spa? I want to crawl through lava tubes and swim with sharks. In French Polynesia, adventure awaits – provided you ignore every resort brochure ever produced. My visit started on the island of Tahiti, which most visitors only pass through on the way to more alluring islands. Can’t imagine why. Turn away from the ocean and you see dramatic peaks and valleys. I wanted to explore, take the unsealed roads where red flowers brush the sides of the car and bamboo creaks. Tibo of Mato Nui Excursions accompanied me. He is one of a new breed of small tour operators in Tahiti willing to give visitors more than a tiare flower behind the ear and a cocktail. For two days, Tibo took me trekking across Tahiti Iti. We camped on an empty beach and ate raw snails. He took me abseiling down waterfalls at Vaipurau and Poutoa. I drew the line at the biggest rappel, which is only for the experienced. There was ample opportunity to recover my manhood by leaping off rocks into pools far below, pummelling my chest as I went. In the hinterland behind Hitia, I clung to another rock ledge and crawled through lava tubes. Lava tubes are tunnel-like caves formed by ancient volcanic action. At Hitia there are three, linked by a series of little valleys landscaped by waterfalls. Basic fitness and sure-footed agility will get you scrambling and wading through the first two lava tubes, tested mainly by a couple of small abseils. The third lava tube is more challenging. It is black and labyrinthine with Gollum-deep pools, smooth rock surfaces and lit only by the drunken dancing of a potholer’s lamp. I passed the narrow opening on my belly in puddles of muddy water. Upon reaching the valley the scenery was glorious and the waterfalls like something from a shampoo ad. I mark lava tubing down as a great new challenge that has been successfully completed. The following day I travelled to Huahine, a small, overlooked island between Tahiti and Bora Bora. The plane skimmed a turquoise lagoon and over the ocean, puffy white clouds wandered like lost sheep on a vast blue plain. Huahine revealed itself like a spectacular magic trick: a wonderland of voluptuous emerald peaks with necklaces of turquoise lagoons and palm trees. The little plane waggled its wings in pure joy and we set down at the airport. It was little more than a hut with two doors – arrives and departs – and the heat enveloped me like a hug from a maiden aunt. For a postcard manufacturer, these islands would be the stuff of palm-fringed fantasy. The more intrepid will discover that Huahine has great jagged rocks and is haunted by wild pigs. A cyclone a few years back wiped out most of its houses and a $70 million resort in a matter of minutes. You can imagine how the rains would have crash down like Armageddon. As acts of God go, it suited me just fine. Few tourists come here, only adventurers, insane backpackers and lots of mosquitoes. Whether you stay in a tiny pension or a beach hut at Huahine’s last remaining resort, you get absolute beachfront, wave-lulling tranquillity. But enough tranquillity. I was soon hanging on to the wheel of my battered rental Jeep as the engine roared and protested and a precipice lurched around every corner. The wheels of my car rattled on bridges made of planking that spanned sluggish brown rivers. Even on the roads, driving has its challenges: dusty dogs refused to get out of the way and a falling coconut dented the bonnet and nearly caused me to end up in the ditch with a heart attack. Four-wheel driving – survived! Lava tubes – done! Kayaking was next. In Huahine you can paddle out into the lagoon and not see another soul. Follow the boom of the surf to a gap in the reef however and you’ll spot the surfers. The consistently large swells of Huahine make the island second only to Tahiti for attracting those in search of waves. Locals are reportedly not taking too kindly to foreigners muscling in on their territory. At least not until you’ve met them, knocked back copious amounts of alcohol together, beaten your chest and talked the surfing talk. A confession: I did spend a couple of days on a beach looking at the sunset and sipping cocktails. After my days of camping, kayaking and mud crawling, I figured that I had earned a stint at the Te Tiare Beach Resort, the only international standard resort on the island. To reach it, a local wearing flip-flops and a flowered shirt picked me up in a boat from a tiny pontoon, where a dog snored and fish glittered in the water. There’s no road access to Te Tiare and by the time I reached my bungalow even the TV and phone seemed like strange artefacts from another civilization. Once my abused muscles were sufficiently recovered, I was ready for more adventure. This came courtesy of an outrigger boat piloted by a local guy named Moana, who played the ukulele and grinned like a cat in a fish shop. There was a tattoo of a turtle on his left shoulder and he had the brown belly of a happy Buddha. We travelled around the island, skipping over the pale blue waters of the lagoon. When I felt too hot I simply dropped off the boat with a mask and a hunk of baguette. A shoal of hungry butterfly fish promptly surrounded me, flaunting black and white stripes and vivid yellow tails. I could hear them chomping on the bread while Moana’s ukulele twanged above somewhere. By afternoon I was swimming with black-fin reef sharks. Moana introduced me to Claude, a local who has developed a unique relationship with the big fish over the years. Most afternoons at 3pm, Claude can be found aboard a floating platform in the lagoon preparing hacked-up fish heads for the sharks, who turn up like clockwork for the feast. Claude invites anyone willing to get into the water with a frenzy of up to 20 sharks. I was soon overboard and stepping, chest-deep along the seabed, anxious about getting a cut on the sharp coral lest a shark mistook me for a hunk of bleeding fish. The sleek and sinister sharks are a thrill up close, especially when you’re in the water with them. Mesmerized by their power and grace, my heart flipped as they cruised within arm’s reach. They turned slowly in the water, perfectly balanced and propelling themselves with indolent flicks of their tails. Back on dry land in time for another postcard sunset, I was weary from my day spent swimming with the sharks but in no doubt that French Polynesia has more to offer than beaches and breakfast buffets. Air Tahiti Nui has non-stop flights from Sydney to Papeete several times a week; they also operate further code share flights via Auckland. Visit the Air Tahiti Nui website at airtahitinui.com.au for more details. 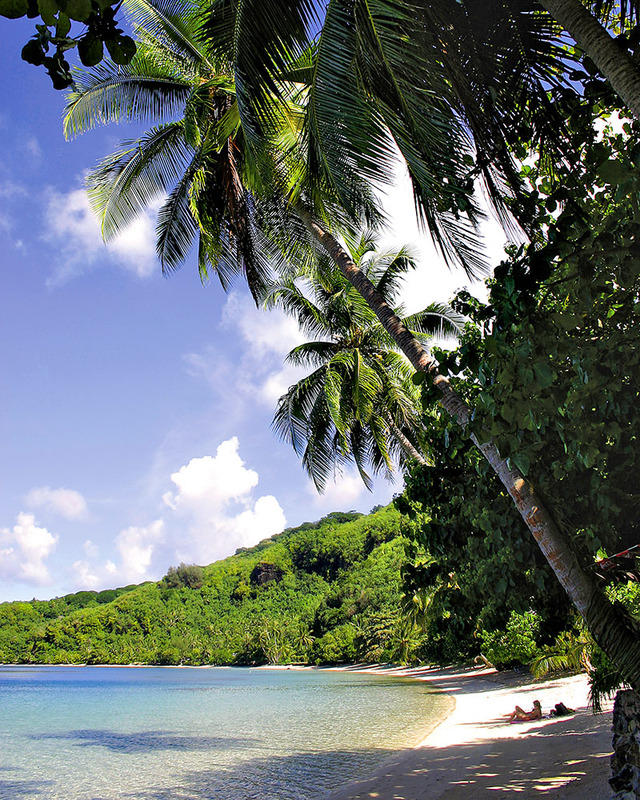 The Te Tiare Beach Resort (tetiarebeach.com) is on the island of Huahine. Diving with the sharks and tours of the island can be organised through the hotel or by Huahine Nautique (huahine-nautique.com) for around $75. Excursions to the lava tubes or hikes on Tahiti with Mato Nui Excursions start at around $175 per person, including lunch and equipment. Call 78 95 47 within Tahiti.